Sound Underwater Images, by John Perry Fish and H. Arnold Carr (1990), is a highly acclaimed text and reference book for users of side scan sonar imaging systems within the scientific, marine engineering, oceanographic and Naval communities. It is a valuable resource to individuals and institutions involved with underwater imaging, sonar design, construction and application as well as those concerned with the collection and interpretation of side scan sonar data. Used in classrooms and at-sea, Sound Underwater Images is a definitive guide for the generation and interpretation of sonar data. The text takes the reader from the early design of sonar systems to how they have advanced to the present day side scan sonar images. 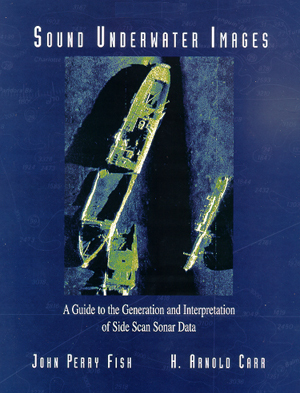 Chapter topics include: - Underwater Sound as a Tool - Applications of Side Scan Sonar - - Theory of Operation - System Configurations - - At-Sea Operations - Record Interpretation - - Mosaics - Detail Mapping - Sonar Targets - Features: an Appendix with common calculations and tables useful during sonar survey operations, 190 pages, 170 B&W illustrations, and spiral binding to lay flat when open.